We have been loving the school holiday break with it’s daily sleep-ins, staying in our pyjamas until 10am, not having to be anywhere at any particular time and especially not having to pack an interesting and healthy lunchbox-full of food every morning! This year I’ve made a promise to myself to be a bit more organised where school lunches are concerned, I want to pack healthy and tasty lunches that my kids will enjoy but more importantly that will give them the energy they need to concentrate, learn and play throughout the day. 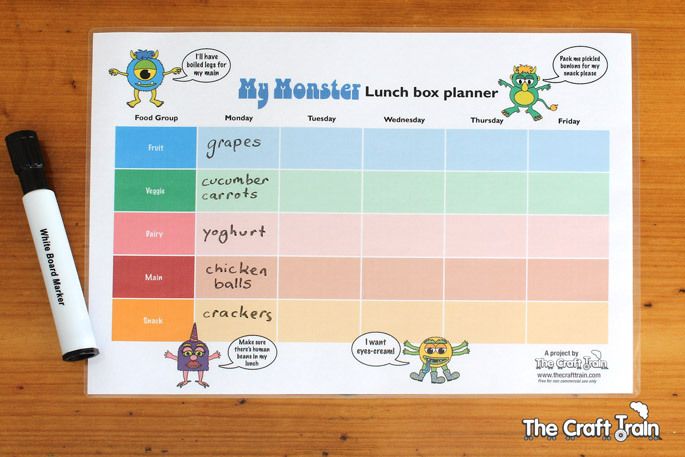 To help me do this I’ve created a printable lunch menu planner that can be laminated and stuck to the fridge or wall, and some colourful monster-themed jokes to add some fun to their lunch break. We were sent a fancy new HP OfficeJet 4650 to review and I thought that our lunch box printables would be a great way to test it out. 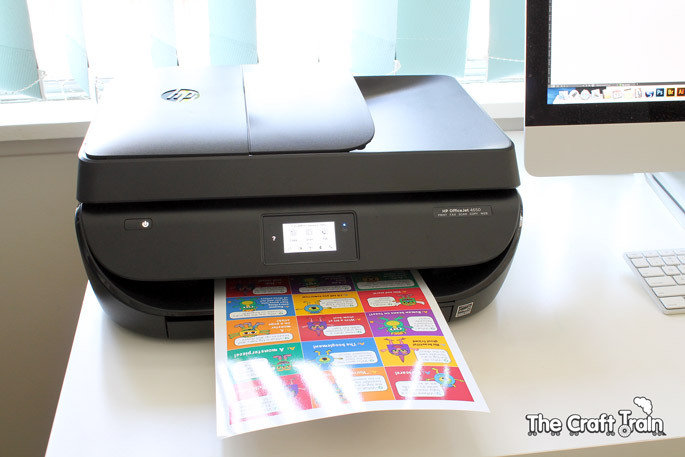 There is also a HP Officejet 4650 printer to give away to one lucky reader! Visit the comments section at the end of this post for your chance to win. To be perfectly honest I don’t have an amazing track record for packing healthy and delicious lunches, in fact I have been known to pack cheese and vegemite sandwiches along with a piece of fruit and a processed, packaged snack day after day, week after week. My kids seem to thrive on repetition and don’t complain, and I know that you can get far less ‘healthy’ lunches than the ones I pack, but I also know how much of a difference it makes to my own energy levels when I have a lunch that is filled with veggies and protein vs how I feel when I just have a ‘quick fix’, such as some toast with peanut butter or similar. For this reason I’m making a change. I’ve invested in some bento-style lunch boxes for my girls, which enable you to pack small portions of all the different food groups that they can eat at their various breaks throughout the day. At my kids’ school they have a fruit/veggie break, lunch break and an afternoon tea break. 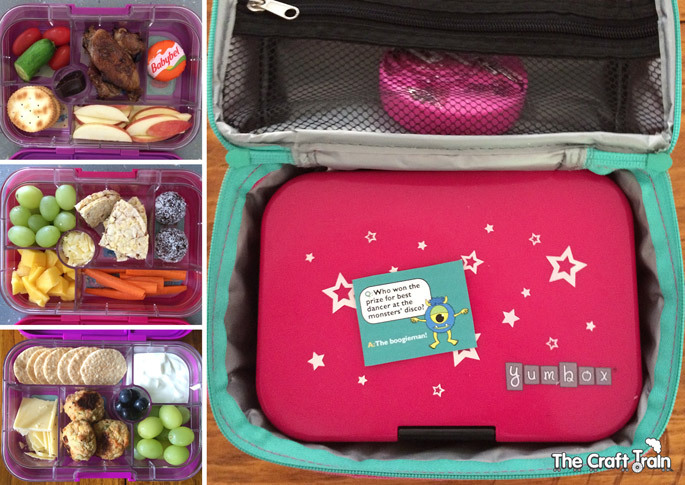 Here are a few examples of lunches I’ve packed when we’ve gone out in the holidays. The meat is usually leftover from dinner the night before. One of my daughters will eat everything, and the other will eat only her favourites and bring half of it home, but I still think it’s important to persist so that she can learn what a healthy, balanced meal looks like even if she won’t eat it. I’m hoping that with time she will begin to try more things and like them as her taste buds mature. For lots of inspiration for different, healthy and varied lunches I can recommend this post about creating a lunch box system over at Be A Fun Mum. I’ve read it multiple times! It includes the space to plan a fruit, veggie, dairy, main and snack. I’d suggest including some form of protein in the main or snack section. 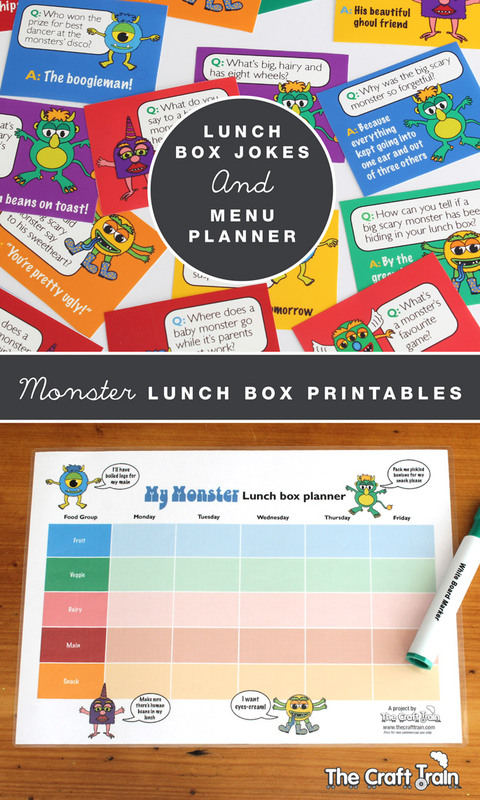 You can find your free printable lunchbox menu planner here. I have laminated mine so that it can be used with whiteboard markers, but if you don’t have a laminator at home you could alternatively cover it with contact (sticky back plastic for our overseas readers) and it will do the same job. Add a fun joke to your lunches – go on, I dare you! 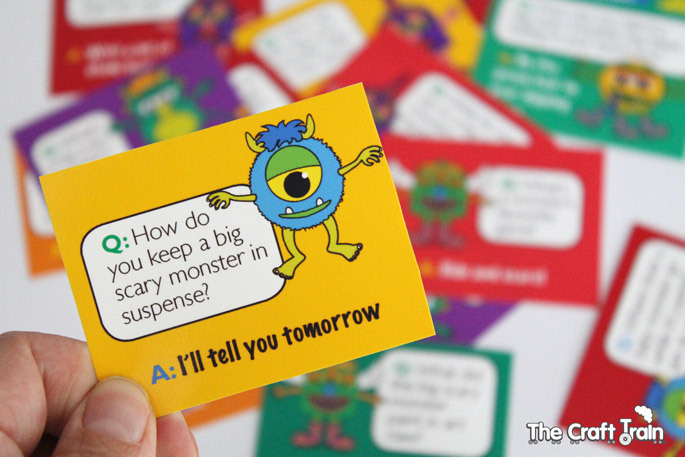 I’ve tested all these jokes out on my kids and they think they are VERY funny, and I like the thought of making them smile when they might be having a tough day at school. 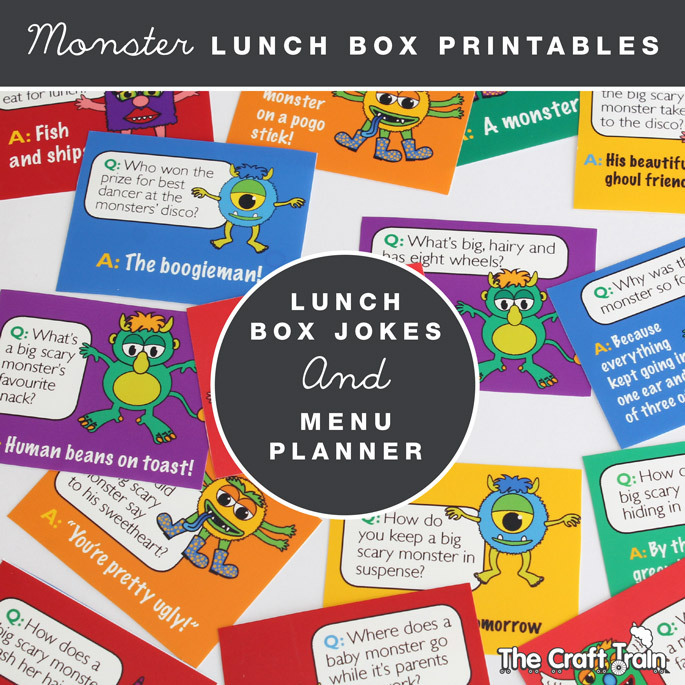 Get your free printable monster lunch box jokes here. 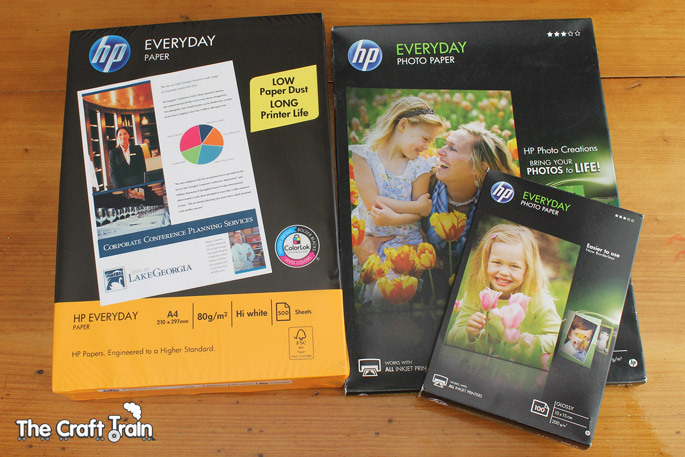 Being from a graphic design and photography background I have always found that using paper which is the same brand as your printer brings out the best colours in photographs etc, so for the menu planner I have used the HP Everyday Paper, and for the joke cards I have used HP everyday Photo Paper. The colours came out lovely and bright! I was pretty impressed with the look of the printer too – it looks pretty slick and modern on my desk in comparison to the old one I had sitting there! The printer comes with all necessary cables should you wish to use them but I chose to set it up with the wireless setting. I am SO proud of myself because I set it up ALL by myself with no help from my more tech savvy husband. I loved my old printer but to be honest I was such a dunce when it came to simple things like changing the ink. I always made a valiant attempt but somehow got confused, did something wrong and had to wait for my husband to get home from work to fix it for me. I know – you would think that being a blogger by trade with a background in graphic design that I would be all over this stuff, but I’m not. The older I get the more confusing it all seems! The HP Officejet 4650 has a touch screen with animations to guide you through every step, it was so easy that I think my 7 year old could have set it up no problem. If printing in bright, true colours quickly and quietly is not enough for you, the HP Officejet 4650 can also scan, photocopy and print directly from your smartphone or tablet. I’ve yet to try printing directly from my phone but it sure sounds pretty good (I’m thinking instagram fridge magnets – print your pics to photo paper and stick them over the top of advertising fridge magnets and voila – insta fridge magnets!). This competition is now closed. Thank you to all who have entered! I am happy to announce the winner as Kate who submitted the joke: “Why was 6 afraid of 7? A: Because 7, 8, 9.” Miss K thought it was hilarious! See the other funny entries in the comments below. Do you know a joke that makes kids laugh and laugh? 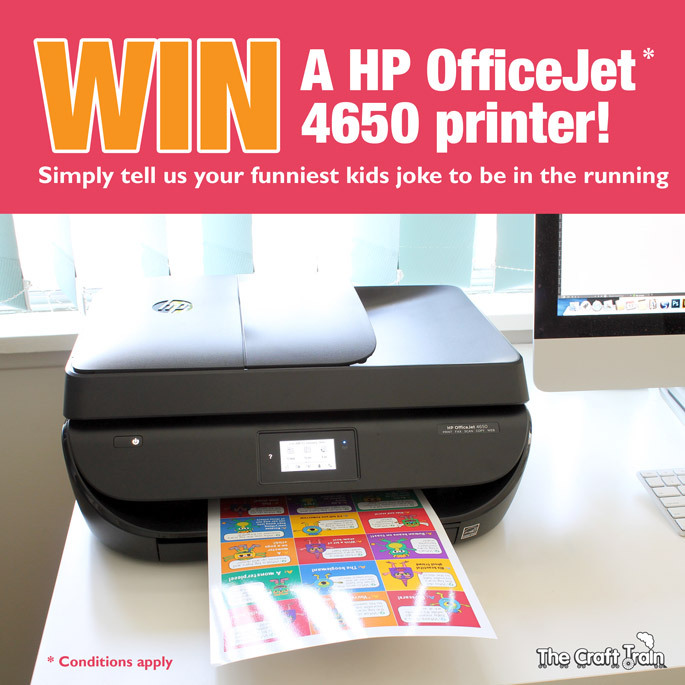 For your chance to win a stylish HP Officejet 4650 Printer just like the one pictured above tell us the funniest kids joke you know. 2. Giveaway open to Australian residents only. 3. Please include a valid email address in your entry so that I can contact you if you’ve won. 4. Closing date for entries is Thursday 4th February 2016. 6. The competition is a game of skill and the funniest joke as voted by my kids and husband wins. 7. The winners will be published on www.thecrafttrain.com and notified by email and will have one week to reply. If no response is received, the prize will automatically be forfeited and a new winner chosen. 8. Prizes will be distributed by HP. The Craft Train takes no responsibility for loss or damage of the items. 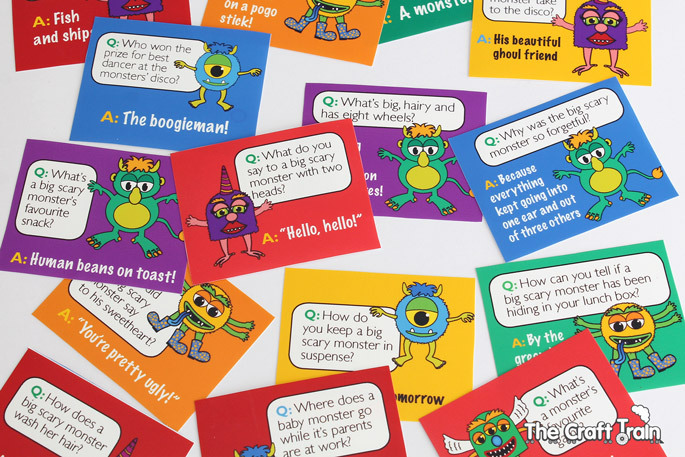 There are lots more fun, free printables on our Printables board on Pinterest. Are you following us? Joke… Q: What goes tick, tick, woof, woof? This is my daughter’s favourite joke. Q What do you call two thieves? Love the HP printer – mine is quite a few years old now, would love the new one! PS Our favorite joke right now is Knock KnocK, Who’s theres?, Banana, Banana Who, Knock Knock (on repeat for way too long), Knock Knock, Who’s There, Orange, Orange you glad I didn’t say banana!